After the request to make a mini version of the Flake King 1000 for use with airbrushes, Flake King have gone one step further and developed two versions - the Flake King 500 Mini Gun and this Flake King 500 Airbrush Adapter. 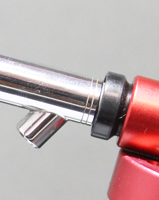 This Flake King 500 Dry Metal Flake Airbrush Adapter fits directly onto your airbrush (when used with the right connector) and is therefore capable of running off an airbrush compressor. 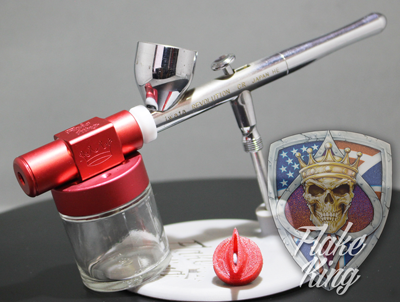 It enables you to apply your clear coat with your airbrush and then simply push on the Flake King 500 adaptor to apply the dry metal flake. You only want to apply the flake with air, DO NOT pull back on the airbrush trigger as this will release clear coat into the Flake Adapter. The Flake King 500 has been designed to be an efficient way of applying dry metal flake. Save time, save material and save money! Simply add flake, open the flake valve, set the pressure and you’re ready to go. It is supplied with a nozzle for easier blending of metal flake passes. 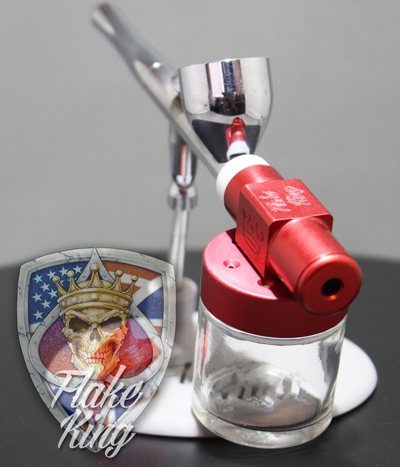 Flake King 500 Airbrush Adapter is ideal for smaller projects – bowling pins, skateboard decks, helmets, bicycle and motorcycle frames. Why apply the Metal Flake dry? To see how to use the gun to apply flake click here. If you’re in the market for a dry metal flake applicator that doesn’t just spit flake out randomly then you’ve come to the right place. This gun doesn’t rely on pick up tubes that can cause flake “flurries”; it truly agitates the flake and draws it out consistently giving you professional results. The dry metal flake is supplied in ready to use pots/jars that simply screw onto the gun – no messing about. Air source (look at compatible compressors). It will apply metal flake from 8 psi upwards, the larger the flake is the greater the pressure needed to agitate it.